On August 21st, Vivendi Entertainment will release The Complete History of the New York Giants on DVD and digital download, which looks at one of the richest organizational histories in all of sports. We got an advanced copy of the DVD for review, and it was pretty amazing being able to relive almost 90 years of Giants football. 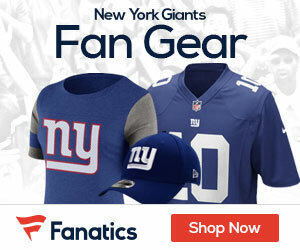 It’s an absolute must-have for any true diehard Giants fan! The New York Giants are coming off another one of the greatest playoff runs in NFL history that culminated in their fourth Super Bowl title. Now NFL Films and Gaiam Vivendi Entertainment have come together to release The Complete History of the New York Giants on DVD and digital download. This exciting program will allow Big Blue fans to relive almost 90 years of Giants football. 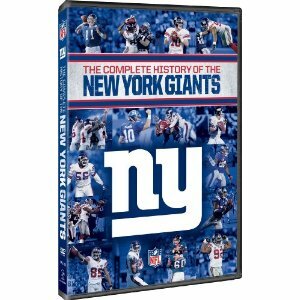 The Complete History of the New York Giants, which has been updated to include the organization’s last two thrilling Super Bowl victories over the New England Patriots, will be available to own on August 21st, 2012. The set will be available in Standard Definition (SD) for $26.97 SRP and for digital download. The Complete History of the New York Giants program is filled with unforgettable moments, Hall of Fame players and thrilling championship triumphs that are sure to bring a smile to the face of any Giants fan. Since 1925, the New York Giants have been one of the premiere franchises in the NFL. Their record speaks for itself – 22 division titles and eight world championships including four Super Bowl victories. This one-of-a-kind set contains more than two hours of new footage, starting with the team’s humble beginnings and continues through their thrilling win over the New England Patriots in Super Bowl XLVI last year. When it comes to recognizable names that have played a role in the success of an organization the New York Giants are second to none with iconic players and coaches including Frank Gifford, Sam Huff, Lawrence Taylor, Phil Simms, Bill Parcells, Michael Strahan, Eli Manning and Tom Coughlin. All of these and many more will be highlighted on this must-own set for Giants fans! You can pre-order this title from Amazon.com right now for only $24.27! I have the original that came out in 2004 I think. I will have to pick this up. Just go the Road to Superbowl XLVI on blu-ray. Started with the Falcons game and now watching the Packers game. Really wish they could have put the little brother (jets) and the cowgirls game on there. I own this DVD and the 2004 Version; its a must have. The new version has everything in the 2004; but no history of the Giants can be called a history without 2007. Definitely get this. A great feauture is replacing the stupid 1958 “best game ever” – a Giants loss to the Colts..and adding “Greatest Games – 2007 Ice Bowl Giants @ Packers” – Its not the whole game, its the NFL Films closeups and interviews. Love it. The “Road to Superbowl” editions of 2007 and 2011 are must haves. Especially 2007; the complete playoff games at Dallas, at Greenbay, and the Superbowl 42, are must haves for every diehard fan. Ive watched them all numerous times. Much more dramatic games than the 2011 run. 2007 Giants were old school Giants football, with Brandon Jacobs flattening defenders at the second level because that O line pushed back the D Line, and opened holes..something the Giants havent been able to do during and since 2011. The 2011 run is like watching the Manning Colts, which is good in its own way, but its not what we’ve gotten used to seeing since the 80’s. The Giants D line of 2007-08 was historically excellent, up there with Purple People Eaters, Fearsome Foursome, its too bad their dominance was only for 2 years, not long enough for a nickname. The Giants overpowered their 2007, AND 2008 Opponents, as the following 12-4 regular season were the most dominant I have ever seen since 1990. Dont confuse individual teams “Road to the Superbowl” with the annual “Road to Superbowl XLII” that NFL films puts out every year, which is an excellent 45 minute highlight package broadcast every year the day of the superbowl, nowadays at 11am on Super Sunday. I purchased I-XL myself, a box set with each Road to SB plus the 22 minute SB highlight reel for every year.